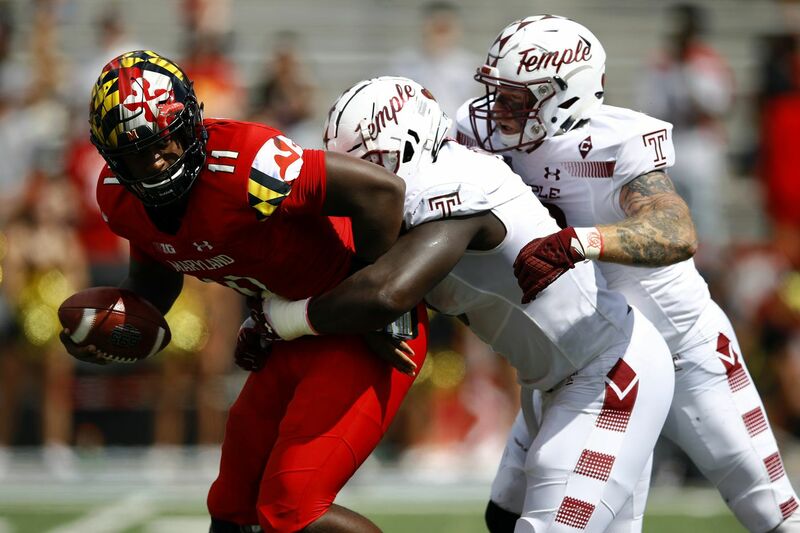 Temple defensive tackle Michael Dogbe (center) and defensive end Jimmy Hogan team up to sack Maryland’s Kasim Hill (left). For someone who is the strongest player on the team, a brick wall of a defensive tackle, Temple graduate student Michael Dogbe speaks softly. He is a classic leader by example. Never has he set a better example in his career than during Saturday's 35-14 win at Maryland. After an 0-2 start, the Owls needed someone to step up, and Dogbe obliged. The 6-foot-3, 280-pound Dogbe collected seven tackles, including 3 1/2 for loss, and 2 1/2 sacks. He also forced two fumbles. In the first quarter alone, he set the tone with 1 1/2 sacks among his three tackles. It was a performance that could have saved Temple's season, and it gives the Owls (1-2) some optimism when they meet Tulsa on Thursday night at Lincoln Financial Field in the American Athletic Conference opener for both teams. Dogbe was named the AAC defensive player of the week, but more important, he did what all great leaders do: inspire his teammates. "It made us play way better," said linebacker Shaun Bradley, who returned an interception 78 yards for a touchdown. "He had a ridiculous game, so that kind of brought all the momentum to us, the rest of the defense and the team." Even the offensive players were in awe. "He is a game-wrecker, a freak inside," said running back Rob Ritrovato, who scored on a 2-yard run. "… It is no surprise when he takes over a game like that." Dogbe had played well in the first two games with nine tackles, including two for loss, but he took it up a level against Maryland. Temple was a 14 1/2-point underdog after losing its first two games, to Villanova and Buffalo, and the Owls desperately needed a leader to surface. So Dogbe, who acknowledged that it was his best game ever, paved the way. "We knew our season wasn't over after the first two losses," he said. "We knew if we came out and dominated like we should, we would have a successful season." Dogbe, who bench-pressed 505 pounds this summer, is an immovable force. What makes him difficult to block is that he not only is strong, but he also has great lateral speed. He spent almost as much time in the Maryland backfield as the Terrapins running backs. "That is what we expect from Dogbe every game. He is a monster," linebacker Chapelle Russell said. Michael Dogbe, with teammate Freddie Booth-Lloyd spotting, squats 415 pounds during a workout. The only person who had a critical word about his performance was Dogbe himself. "I am really hard on myself," he said. "I was looking at little things I could have done better." Tuesday, Dogbe was conducting interviews with the media and his teammates were giving him a hard time, with some good-natured ribbing about getting the star treatment. Dogbe laughed, although he did his best not to pay attention. Despite his size and strength, he can't escape receiving the business from his teammates. Yet it's hard to imagine any player who has garnered as much respect from his teammates and coaches. "He was all over the field and living in the backfield and had a career performance," Temple coach Geoff Collins said. "If you know Michael as well as I do, that is just setting a standard he will try to break this week and then try to break next week." Records: Tulsa (1-2, 0-0 American Athletic Conference); Temple (1-2, 0-0). When and where: Thursday, 7:30 p.m., Lincoln Financial Field. Coaches: Tulsa, Philip Montgomery (4th season, 19-22); Temple, Geoff Collins (2nd season, 8-8). TV/Radio: ESPN/97.5 (FM) The Fanatic. Series history: 2-2. Temple has won the last two, including 43-22 in last year's regular-season finale to become bowl-eligible. Special teams. Temple has scored in each game on special teams, including a 36-yard touchdown pass from Todd Centeio to Freddie Johnson on a fake punt during last week's 35-14 win over Maryland. The Owls also have scored on a blocked field goal and a blocked punt. Many of Temple's starters play special teams. Under special teams coach Ed Foley, this is an aggressive, difference-making unit. The passing efficiency of Tulsa sophomore Luke Skipper. Last week, the Owls dared Maryland to beat them by the pass, and the strategy worked. Maryland gained just 195 total yards, only 63 through the air. A similar tactic will likely be used, especially since Tulsa is averaging 210 rushing yards and 4.4 yards per carry. Skipper has completed 61.3 percent of his passes for 521 yards, four touchdowns and three interceptions. He also can hurt teams running the ball, so stopping him from turning the corner will be a key. But Temple will likely try to take away the outside run and make Skipper show he can beat the Owls with the pass. Aggressive nature. In its opening two losses, Temple lay back a little at the beginning of games and was outscored by 19-3 in the first quarter. During Saturday's win, Temple led, 7-0, after the first quarter and came out aggressively on both sides of the ball. The Owls had four first-quarter sacks and allowed Maryland minus-2 yards rushing. Temple outgained Maryland, 90-21, in total yards in the first quarter, setting the tone for the rest of the game.